You have now Shifted into 5th – The Grace Gear! Shifting is work! Anyone who has ever driven a “stick shift” knows! We must push the clutch, down-shift, shift up again, set the parking brake and do a whole lot of work just to get where we need to go. The lower gears are basically for doing the “grunt work”… stopping, starting and just getting around. 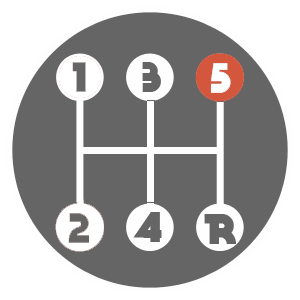 However, the beauty of a stick shift is driving in the higher gears – especially 5th gear! In 5th gear we can accelerate and just cruise along! This gear is MADE for the highway! It is not just fast, enabling huge amounts of acceleration quickly, it’s smooth! Whereas the lower gears take a lot of work to go short distances, the higher gears are EFFORTLESS for the long haul! Once our vehicle is in 5th gear, we can just cruise for miles! This went off inside of me! I know that many, including me, have been “driving around” in the lower gears – 1st, 2nd and even 3rd – for a long time, perhaps even years. But God! Over the last few seasons, He has been shifting us into increasingly higher gears, enabling us to go farther, faster. Now, with this most recent shift, many have been shifted into 5th gear – the Grace Gear! This is the Grace Gear! 5th gear in any vehicle is so incredibly easy! We can just sit back and enjoy the ride! In the Grace Gear, we can allow God to be God and rest in Him! We can take our foot off the brake and put it exclusively on the accelerator. “But just as we have been approved by God to be entrusted with the glad tidings (the Gospel), so we speak not to please men but to please God, Who tests our hearts [expecting them to be approved],” (1 Thessalonians 2:4). In the Grace Gear, not only are we operating in our God-given grace and anointing, we are also operating in trust – His trust! He trusts us to operate in this gear! He has trained us, raised us up and He has given us the green light. He has hit the “GO” button! So GO! This means that in the past, in those “lower gears”, we may have had some double mindedness (see James 1:8), doubt or trepidation about what the Lord has called us to. In the Grace Gear, in this accelerated mode of transportation, there is no time for that! Many years ago I was a passenger on a motorcycle. The driver had no inhibitions about traveling fast! In fact, as he screamed down the freeway at an incredible rate of speed, the telephone poles appeared as toothpicks. We were moving so fast that one came up so quickly after the next it almost appeared as a picket fence! This is the Grace Gear! Just like on that motorcycle, the Grace Gear is fast! The Grace Gear is traveling at warp speed! What used to take years will now take only days, or perhaps even hours! At this rate of acceleration, we must simply trust God to be God, and take Him at His Word to do what only God can do! “Lean on, trust in, and be confident in the Lord with all your heart and mind and do not rely on your own insight or understanding,” (Proverbs 3:5 AMPC). Whether it is business or finances, relationships or ministry, we must trust God to trust us with what He is doing! If we will just listen and obey, then act quickly on what we hear, we will see amazing Grace in action! Simply move out of the way; do not try to control the outcome, and expect Supernatural results. You will see them in the Grace Gear! It is time for us to move forward, quickly and obediently, in the Grace Gear! It is time for full speed ahead! Take your foot off the brake and place it fully and confidently on the accelerator! No more down-shifting! Go far and go fast in the Grace Gear! Previous Previous post: It’s Not Too Late! You Cannot Stop the Plans of God! Next Next post: Time to Get Packed!